To call Formidable Vegetable Sound System unique would be a gross understatement, however this award-winning West Australian oddity of a band has become notorious across the globe for their dynamic live performances promoting sustainability and the joys of gardening through dance music. Out to prove that ukuleles and electroswing CAN save the world, Formidable Vegetable Sound System are a somewhat eccentric experiment in 'ecological edutainment'. With energetic vintage-style live mashups of wonky glitch and antique beets, swing ukulele and hyperactive horns, Formidable Vegetable Sound System have only one goal: to pound simple solutions for sustainability deep into your consciousness in the funkiest way possible. Paving the way towards a new genre of music based around positive solutions to some of the biggest problems on the planet, Formidable Vegetable Sound System are rapidly becoming a favourite on the international festival circuits, having performed everywhere from Woodford to Glastonbury (alongside The Rolling Stones). 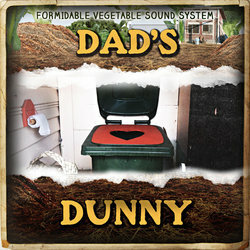 Remember the good old Aussie back-yard dunny? Well, in this age of water scarcity and sustainable innovation, it's making a comeback! For the first time this year, Formidable Vegetable Sound System bring us their Number-Two hit song about a long-drop with a difference.